The idea behind the "sharing economy" has fascinated me for a while. Sharing is caring, goes the saying, but the "sharing economy" (or collaborative consumption as some call it) gives this maxim a whole new meaning. Nowadays, sharing rhymes with caring about optimizing untapped or underutilized resources, boosting one's own personal finances, and perhaps most strikingly, caring less about ownership and more about freeing up other valuable things. More space, more cash, more time. Lately, a few newcomers have really caught my eye as they delve deeper into the whole sharing, repurposing movement. One of them is Lyft Line, the new addition to the Lyft.com family. When requesting a Lyft Line, you actually ask for a shared ride and split the fare with other passengers sharing a common route. It really struck a chord with me when I first read about it in techcrunch.com. I had seen a precursor of this during my trip to Cuba 15 or so years ago. Back then, I often took a local guagua, cute name for a shared ride, which in Cuba’s underground economy, also referred to those 1940s cars that would go up and down the same road all day long, picking up and dropping of passengers along the way, for a few pesos. Essentially, Lyft Line is bridging the gap between the HOV lane of transportation and the personal ride; better than a crowded bus, less expensive than a private chauffeur. Another company that I find really intriguing is Breather, because it promises to find "beautiful, private spaces that can be reserved for any length of time". Until now, every company offering shared spaces did so, on a minimum daily basis, but Breather can get you a space for a quick 30 minute recharge. I first discovered this company through one of my friends, who was looking for spaces to teach classes throughout the city. She needed rooms that could accommodate small groups and she needed those spaces to be in different areas of the city. Breather ticked all of her boxes. Their spaces are well located, clean-looking, and start at around $26/hour in NYC. Because I work freelance, and may want to impress a client or two by setting up an impromptu meeting, this could really come in handy. At first glance, I really like their easy-to-use app and the look of their spaces. The furniture has a dash of mid-century modern and is cohesive throughout most of their spaces, so their brand identity feels strong. Closer to my heart and even more to my stomach, the company PareUp, whose motto is: “good food is a terrible thing to waste” is one I am really excited about. In an effort to reconcile overproduction and a growing demand for goods at a lesser price, PareUp offers to link consumers with companies that have unsold, unexpired goods to be had for a discount. The company was featured in a Huffington Post article I read, which stated that food decaying in landfills was the third largest contributor to greenhouse emissions. Not only is the idea of millions of cupcakes rotting a sad, sad one, but the idea of those cupcakes damaging our planet really has a way of prompting the good citizen in me to stand up and do something about it. 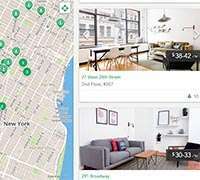 Rather than paying full price during rush hour or going dumpster diving after store closing, consumers can now go online and search for available offers within their zip codes. So far, the offers are not incredibly impressive, but since I am always looking for ways to lessen the strain put on our ecosystem by our ever-growing consumerism needs, I say Sign me up! I love this idea, and what it represents, in terms of maximizing the production chain and shifting people's perception of a baked good on sale. Guagua: Ride sharing - Cuban style! Breather: Promises to find "beautiful, private spaces"